Spingo is a twist on the classic game of roulette, blending elements of the little wheel and bingo into one enjoyable package. It’s a popular casual title offered at many Microgaming casino sites recommended for players seeking an easier game. Read on to learn more about its house edge, payouts, rules and betting options. Spingo is a fairly straightforward online real money casino game with a familiar table layout to any European roulette game you will find at online casinos and land-based live venues, only slightly altered to accommodate its bingo influences. Instead of having up to 36 numbers, Spingo only uses numbers 1 through 10, with single-zero still remaining on the outside of the betting grid. Numbers are written on the balls rather than the wheel (closely resembling bingo) with 21 balls randomly drawn from the Spingo pool. Every number has two balls, and single-zero has one. The wheel is coloured and comprised of eight red, yellow and blue pockets and a single green pocket. The objective of Spingo is essentially the same as roulette: Players need to bet on the outcome of a spin based on their own predictions of the number on the ball and the colour the ball lands on, which is the winning result. 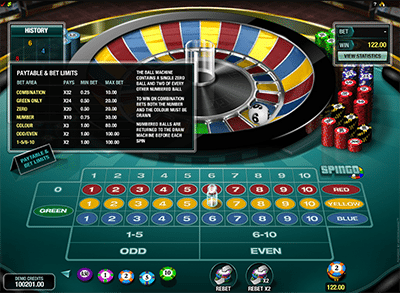 The game features the standard roulette betting layout and little wheel, but with four colours (red, yellow, blue, green) comprising three columns of the numbers one to ten. Three of the colours (red, yellow and blue) make up three columns, with green offered as an outside bet next to zero. Odd and even bets are available as outside bets, as are wagers on numbers 1-5 and 6-10. To play, first deposit your desired amount of playing money/bankroll into your casino account (we recommend RoyalVegasCasino.com). Choose your chip size, which ranges from $0.25 to $10.00, and place your wagers on the table by clicking the respective colour/number/even/odd grid. There is a maximum limit of chips you can wager on per bet type, which we will explain in more detail later in the article. Once you are done placing your chips, click the ‘Spin’ button to get the game going. The numbered ball will be spun, and eventually land on a pocket in the wheel. A virtual dauber will be placed on the table to signify the winning number and colour, and the result will also be clearly displayed on-screen. If you correctly placed a winning bet, your earnings will be shown in the top-right corner of the game screen. A neat feature of Spingo is the Game Statistics, which you can access by clicking the ‘View Statistics’ button under the results windows on the top-right hand corner. Here, you can see the results and percentages of all of your previous spins. Gameplay can resume with another round of betting or a re-bet of the same wagers you made with a click of a button. If you prefer to have your rounds automated, there is an autoplay option where you can a number of rounds to be spun. Autoplay will play your chip placements across your desired amount of rounds, automatically paying your account out if you win, and will resume until all rounds are complete, you manually stop the game or the game reaches the lose/win limit. Spingo has a variety of different wagers available to the player, and all suit different bankroll limits. Each betting option has a minimum and maximum bet limit and differing payouts according to the risk. All are helpfully detailed within the game by clicking the “Paytable and Bet Limits” sign on the left-hand side of the virtual Spingo table, but we have included them in this article and what they entail for easy reference. 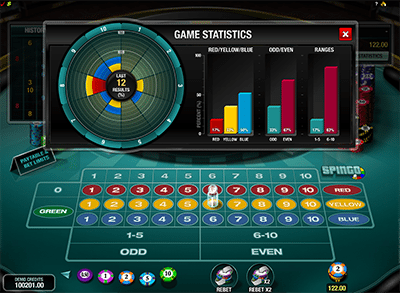 Combination – Place a bet on a specific colour and number. Minimum bet is $0.25, maximum bet is $10, and payout is 32:1. Green only – Place a bet on the colour green only, which has only one section. Minimum bet is $0.50, maximum bet is $20, and payout is 24:1. Zero – Place a bet on zero. Minimum bet is $0.50, maximum bet is $20, payout is 20:1. Number – Place a bet on the number – the winning colour does not matter. Minimum bet is $0.75, maximum bet is $30, payout is 10:1. Colour – Place a bet on a specific colour – red, yellow, or blue – the winning number does not matter. Minimum bet is $1, maximum bet is $80, payout is 3:1. Odd/even – Place a bet on whether the winning result is odd or even. Minimum bet is $1, maximum bet is $100, payout is 2:1. 1-5, 6-10 – Place a bet on the winning result being in the range of 1-5 or 6-10. Minimum bet is $1, maximum bet is $100 payout is 2:1. The house edge for Spingo’s many bets varies wildly. The best bet to make a combination bet (wager on both the winning colour and number), which has the lowest house edge, at just 2.48 per cent. Spingo is a fun hybrid of roulette and bingo which will appeal to fans of both games looking for something a little different. It’s casual, easy to understand and the pacing suits players who like to take their time and don’t like the pressures of skilled-based table games or card games. 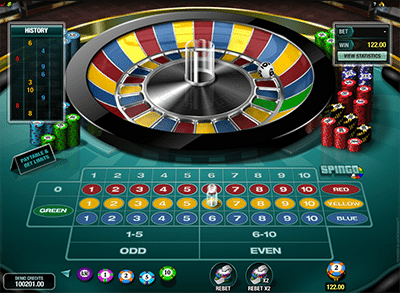 The design and interface is very sleek as expected from Microgaming, with easy navigation, stylish graphics and a soothing soundtrack. Give it a go if you’re in the mood for something just a little bit different from your usual go-to roulette or bingo game. As Spingo is a real money online casino game by Microgaming, it can be found at casino websites which offer Microgaming titles. Many of the casino sites we recommend have Spingo and support AUD deposits and betting such as RoyalVegasCasino.com. It is a desktop-only game and can be played in instant-play mode (through Web browsers such as Chrome or Firefox) or by downloading Royal Vegas Casino’s special downloadable casino software. It can not be currently played on mobile.